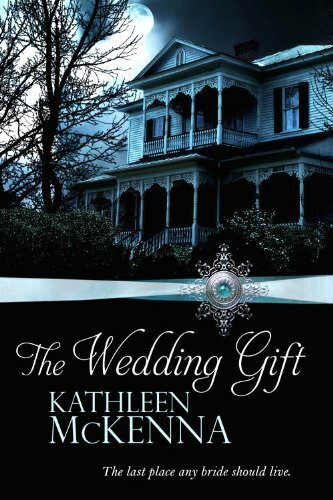 Let me first start by saying I was contacted by the author of the book Kathleen McKEENA and was asked to read and review her book, The Wedding Gift. I loved the cover and the synopsis of the book so I decided I would give it a go. I am so happy that I did because this book was amazing! Right from the start I was hooked on this book. The story-line drew me in and keep me there wondering what would happen next. The Wedding gift has so myuch character and mystery - never a dull moment. So the book begins with a house - A huge, beautiful home made for a large family. Prefect in every way. Oh, expect the part that it is hunted. Many years ago a family lives there - A Dad, a Mom and some beautiful children. One day the Mother, Robina went a little crazy and killed her whole family. Now Robina stays around to haunt this not so prefect house. Soon you meet the main character Leanne - The book is written from her diary, Leanne's POV. She has always been the prettiest girl in town and everyone loves her. She lives in a small town where everyone knows each other and there are no secrets. She has been in love with her Brother's childhood friend since well always but never has the nerve to tell him the way she feels. Now it is to late becuase someone else has taken a liking to Leanne and after accidently getting her pregnant find the only solution is marriage. Although Leanne does not really feel that she loves George she decided to do the right thing a marry him. One perk is his family is very wealthy so George will have plenty of month to keep up the marriage and soon to be family. On the wedding day something happens to change there lives but Leanne knows she must stay with George. So out of the blue George announces that his family has given them a wedding gift - Only to find out the gift is the old house and will become more than meets the eye. When very strange events begin to happen in the same home where Robina once killed her family, Leanne will find any way she can to get out and away from these haunting's. But it wont be so easy because something has been buried within the home. Not a someone but a secret that has been hiding there for too long... Only the dead knows the truth about what really happen in the home and will find anyway she can share this secret with Leanne. I really enjoyed this book, the story was very interesting and keeps you on the edge of your seat wondering what would happen next. A fun, fast paced, highly entertaining mystery. I loved the character's in the book. Leanne was a fun character although I found her to be kind of shallow and into herself. I liked that there was plenty of back story to help me understand more about the life of the house and what happen long before George and Leanne moved into it. I find a book a lot more fun to read when I do always know what will happen by how it is written and The Wedding Gift was not at all predictable. I adored that the setting of the book was in the south, since I once life in the south I found this to be refreshingly nice. Although my one pet peeve I had with the book was that Leanne would say the words "To me strictly honest" quite often and I got tired of hearing it. I do understand that she was from the south and talked different because of it but after a while I found myself getting tired of hearing her say that so often. Other that that I very much enjoyed the book and would so recommend it to anyone who enjoys a good scary story with a twist of suspense. The author Kathleen McKEENA did a fantastic job writing the book and giving the reader a great spooky yet fun story. Great review! This isn't a book I'd normally pick up on my own, but your review has intrigued me. thanks! Hi. New follower via Goodreads Blogger Lift. Ooh I love mysteries! I haven't really checked this one out before but I have seen it around. Great review!